Looking at yesterday's entry, I couldn't help but feel a bit like a real estate agent running from address to address. 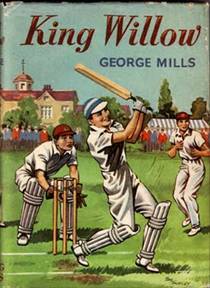 With that in mind, let's look at an actual listing for flats in Bude, Cornwall, at the former home of George Mills's grandfather, Arthur Mills! Efford Down House was constructed in the early nineteenth century. It was the private residence for Agnes Acland and her husband Arthur Mills MP. Her father Sir Thomas Acland had given the land to Agnes as a wedding gift, Arthur Mills was the member of Parliament for Taunton and later Exeter and was a leading figure in the Bude community. The house later became a hotel. In 1989 Efford Down House was tastefully converted into individual luxury apartments offering superb accommodation in one of the most enviable positions in Bude. In all this 2 bedroom apartment would be considered ideally suitable for holiday use or retirement and early viewing is recommended to avoid disappointment. The accommodation briefly comprises entrance hall, lounge/dining room, kitchen two bedrooms with en-suite to master and separate shower room, further complimented by gas fired central heating and UPVC double glazing. 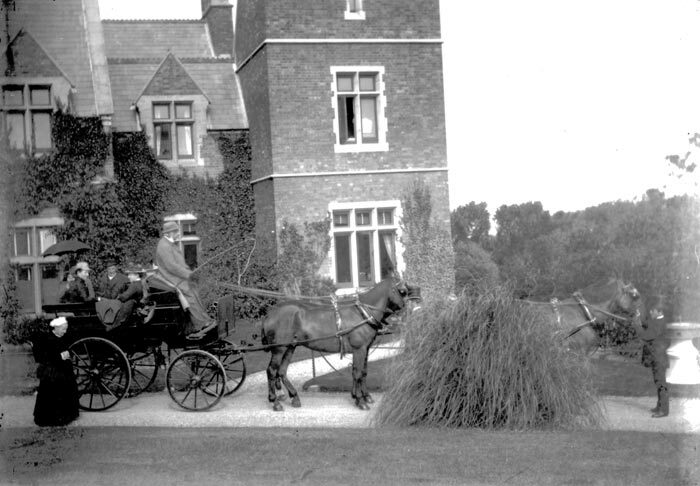 Lady Agnes Lucy Acland Mills [presumably in the carriage, left, being driven by husband Arthur] had passed away on 23 May 1895, never living to see the births of grandchildren Agnes [her namesake, born just 19 days after her death], George , or Violet Mills . The executor was Reginald Brodie Dyke Acland, barrister, not Arthur Mills. My hunch, then, is that the Efford Down House did not go to Arthur after her demise. Arthur himself passed away on 12 October 1898 leaving an estate probated at £42 035 to Reginald Brodie Dyke Acland, barrister, Theodore Dyke Acland, MD, the Rev. Barton Reginald Vaughan Mills, and Dudley Acland Mills, major in the Royal Engineers. Even adjusting in my mind for inflation, cost of living, etc., I just can't see how that £42 035 included the property and home at Efford Down [pictured in the 1890s, below, at right, and today, below, at left]] , as well as Arthur's colonial properties, flat in London, and various other holdings. Soon after Arthur's demise, Rev. Barton Mills left the vicarage at Bude for the Chapel Royal at the Savoy in London in 1901. It is presumable that he had some of that £42 035 in his pocket, possibly up to ¼ of it, and perhaps more, depending on how barrister-proof was Arthur's will on behalf of his sons Barton and Dudley. The Mills family, as we know, ended up in London in 1901, and that he'd already conducted a service at the Chapel Royal by that time: The year of 1901 marked the passing of Queen Victoria on 22 January. Barton R. V. Mills preached his first sermon at the Chapel Royal on 2 February 1901 at the Festival of the Purification, Memorial Service on the day and at the hour of the Funeral at Windsor of Queen Victoria. Records show that the preachers on that day were "T E Franklyn, Assistant Chaplain, and Barton R V Mills, Vicar of Bude Haven, Cornwall." It's unclear whether he'd been invited to participate, and as a result ended up in the employ of the Savoy, or if it was already accepted that he'd soon become a cleric there. He'd apparently also preached Ash Wednesday and Good Friday services in the Chapel Royal before he was officially listed as an assistant chaplain on the 25th Sunday after Trinity, 24 November 1901. Nonetheless, the family of the Reverend Barton had been residing at 13 Brechin Place in London by the evening of the 31 March 1901 census. Had he come to town knowing he had a job at the Savoy waiting, or because he needed to find work and London seemed the place to find it? I've always assumed that Barton left the vicarage at Bude of his own accord, but the vicarage itself was endowed by the Acland family. Perhaps I've been mistaken. Is it possible he actually had been removed from his post in Bude Haven in favor of a new vicar who was a closer relative of the Aclands, or at least someone held in higher esteem at the time? After all, he'd seen a long-time vicar of Poughill unceremoniously thrown over in favor of him in the recent past. Might the connections of the powerful Aclands have arranged for his position at the Savoy, or at least been a foot in the door? Had he, his wife, and his children, been disenfranchised since his most direct living benefactors had all passed away by the outset of the 20th century? One wonders. 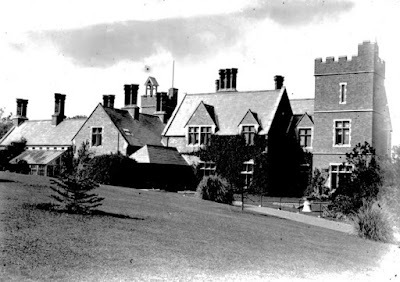 I have to doubt that much, if any, of the value of the property and manor at Efford Down went to London with Reverend Barton, or covered his moving expenses. You, however, have an opportunity he likely never had: To own a piece of Mills family history in Bude! For just £245,000, you could own a two-bedroom flat [sitting/dining or "reception" room pictured, right] in the manor at Efford Down! Just call 0843 315 1302. £245000 for two bedrooms and two baths: It's enough to make a wealthy fellow like Arthur Mills believe that he was born by far in the wrong century! I invite any thoughts, information, or speculation you might have into wills, probate, inheritance, or property you may have regarding the late 19th century. That said, enjoy England vs. the U.S.—it should be a good one! Thanks a loot for such a writing. It's like a eye opener.I belong here in Uk. I need double glazing suppliers guide badly but couldn't find.Now I think agent is the best option of reliable and prompt outcome.